Pareidolium is a circular fountain that creates portraits of onlookers in mid-air with clouds of vapor that ascend from the water basin. 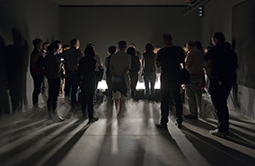 As a visitor looks into the water, a facial-detection system extracts their image and creates an ephemeral likeness in cold vapour. The portrait becomes tangible, almost breathable, only briefly, then disappears in turbulence. Call on Water is a fountain that writes words in mid-air with plumes of cold vapour that ascend from a water basin. Dozens of poems by Mexican writer Octavio Paz are presented which describe readable air, the moment when the written word is spoken and becomes the atmosphere itself. The poems’ content becomes tangible briefly, almost breathable, then disappears in turbulence. View Details. Two million pamphlets were printed in elemental gold, higher in purity than 24-karat gold, using nanotechnology techniques. Around 250,000 copies were released in the exhibition room so they remain floating around in the air, potentially inhaled by the public. These pamphlets are 150 atoms thick and are biologically inert so pose no health risk. 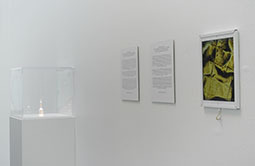 The rest of the pamphlets are shown suspended in water together with images taken by an electron microscope. The text engraved onto the gold leaflets is an excerpt from the Ninth Bridgewater Treatise (1837) by Charles Babbage. The text posits that the atmosphere is a vast repository of everything that has ever been said and that we could potentially "rewind" the movement of every molecule of air to recreate the voices of everyone who has spoken in the past. View Details. 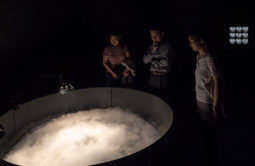 "Pulse Tank" is an Interactive installation where the heart rates of members of the public are detected by sensors and converted into water waves in a ripple tank. 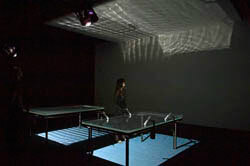 A light show is created by the resulting waves and their interaction. To participate, insert your finger into one of the four cylinders on the side of the tank or put your hands flat on the front panel; the computer will detect your pulse and activate a solenoid which will hammer your heart rate onto the tank. View Details.